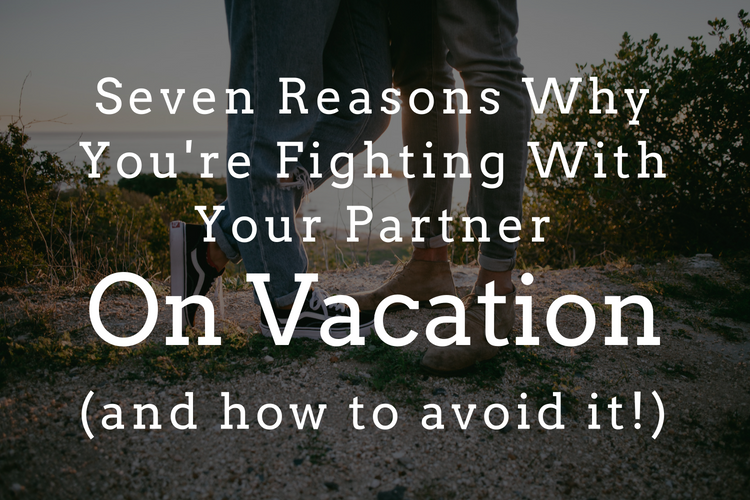 Fighting with your partner on vacation can be an unwelcome surprise. After all, vacation is supposed to be a time when you get to unwind and take it easy. Though conflict is hard to handle and not what you want to be doing on vacation, it’s a fairly common experience. Many couples find themselves bickering and out-of-sync with each other during time off. For various reasons, fighting with your partner on vacation is to be expected. Here’s why and how not to let it take over your chance for rest and relaxation. 1. There is a lot of pressure and expectation on vacation. You only get a limited amount of time off every year. You work hard and often plan for a vacation well in advance. A lot of needs may be put aside during your busy life that you hope will be met during vacation. For instance, it’s likely you hope for time to rest and relax, but also moments of adventure and excitement as you explore the world. You want to come back feeling rejuvenated and this desire creates expectations. Although these expectations may seem obvious to you, they’re often a mystery to your partner. Talk with your partner about your expectations and identify what you want out of vacation time before you go. 2. You’ve rarely spent this much concentrated time together. Because of work, errands, and family obligations, time apart is built into your daily lives together. At home, you may not have a lot of concentrated time together and may cherish those few hours when you do get to connect with your partner. Depending on how busy your life is, you likely soak up quality togetherness at the end of the day or week. There may be pressure to spend every minute together on vacation because you’ve been craving more together time. This intense drive to be together can backfire. Your good intentions can have the opposite effect—like fighting with your partner—because you each have different needs and are not used to spending every minute of the day together. On vacation, you may feel that you have to sync your needs and schedules together. Maybe you relish alone time during your commute so you can listen to your favorite podcast or maybe you like to spend your lunch hour at a yoga class in your daily life. But when you’re on vacation, you don’t carve out that time away from each other. Try and make space in your vacation schedule to stick to some of your personal routines, like going to the hotel’s gym to work out or taking a walk on your own. 3. Things that have been pushed under the rug resurface. Things that have been pushed under the rug can resurface on vacation and cause conflict. Tensions can rise to the point where you and your partner start arguing. Concentrated time together, space for distraction-free thinking, and the lack of an endless to-do list gives you both lots of time to reflect. For example, if your partner’s drinking bothers you and you notice they want to stop for a glass of wine or cocktails during the day while you don’t, your irritation about their drinking may intensify while on vacation. When you are not on vacation, you might not like that they drink too much on the weekends, but you rationalize that they are blowing off steam and dismiss it. Or maybe your partner has a way of trying to control things that is amplified on vacation. Or maybe there is conflict over your future and this comes to a head when you’re away from the rush of everyday life. 4. You have time to reflect on your life and gauge your true happiness. Not only do you have more time to think about your relationship while on vacation, but you also have time to reflect on your life as a whole. Vacation gets you out of automatic pilot. In your day-to-day life, there often isn’t time to really think about how your life is going and whether you’re content. Or you think about it and then get distracted by the next thing. Time away from both work and your regular routine leaves time and space for you to think about your life in new ways. For instance, you may realize your work is unfulfilling or that you want to revisit an old hobby. Perhaps if your vacation is nature-oriented, you might discover you don’t want to wait until a couple of times a year to have time in nature. Rather, you want these experiences to be a more significant part of your regular life. Maybe the tranquility of lying on a beach reading a good novel feels like the best thing in the world and you wonder why you don’t make time to do this at home. Recognizing what isn’t working in your life may bring up feelings of anger, resentment, or sadness which can all make you more prone to snapping at your partner. 5. You may need different things to relax. You and your partner may vacation differently. You may have different preferences on how to relax and how to approach the unfamiliar. You might like to plan an itinerary so you know what you’re doing every hour of every day. Planning might help you feel secure, especially if you are navigating a foreign country or a challenging hike. Your partner might prefer to fly by the seat of their pants, relishing unstructured time on vacation. Feeling like sleeping in? Great. Want to get up early and watch the sunrise? Do it. For some, being able to be spontaneous this way is very nourishing. For others, it’s anxiety provoking. To avoid fighting with your partner on vacation, discuss your vacation preferences beforehand. Consider how you can each glean the best of your vacationing styles instead of making one of you wrong and the other right. There is wisdom and value in both structure and spontaneity. 6. You might spend money in different ways. Whether it’s spending money during your everyday routine or while on vacation, you likely have different spending habits than your partner. While you might want to invest in local works of art on vacation, your partner might be more interested in spending money on highly rated restaurants. So talk with your partner about how and where you will spend money before you head out the door. You can set a budget for meals, shopping, and activities if you’d like. For many, vacation is a time to indulge. Creating financial limits doesn’t need to squelch the experience of indulging but it can ease stress and worry by setting up a spending plan that works for both of you. 7. You’re off-routine in terms of how you care for yourself. Vacations will throw you off your regular routines. If you flew to another time zone or drove many hours before reaching your vacation destination, you’re probably suffering from jet lag or travel fatigue. Being tired makes you more emotionally vulnerable, as does eating or drinking too much. When you’re more emotionally vulnerable, you’re more prone to being irritable with each other. A way to avoid the off-routine struggle is to maintain as much of your daily self-care as possible. For instance, if you always go for a brisk walk before you eat your granola for breakfast, try and stick with that routine. Remember vacationing is about pleasure, rest and adventure (depending on what your vacation style is). So do what you can for yourself so you can get the most out of your time away. *Do you want help reducing conflict with your partner on vacation? Couples therapy can help you reduce conflict with your partner while on vacation and at home. Call (415) 310-5142 to get started with therapy in San Francisco. We offer individual therapy, couples therapy, and adherent DBT.